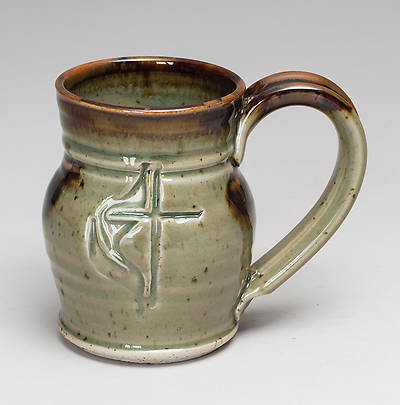 This unique and beautifully handcrafted green ceramic mug is deeply etched with the Cross and Flame emblem. This large capacity barrel-shaped mug with an easy-to-grip handle is highly functional and easy to use. This mug is also available in tan and blue, with straight-shaped mugs available in green, deep blue, and tan. This product is dishwasher safe, microwave safe, oven safe, and completely lead free.